Smoky eyes are big news again for AW08. So if you didn’t quite manage to perfect it last year then you’ll get another chance this year! 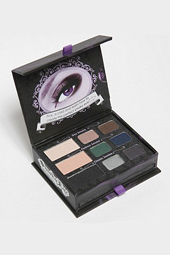 One major problem with creating that perfect smoky eye effect is that it seems to take a lot of products to achieve it. There’s an eyeshadow base, then the eyeshadows – a dark colour and a glitter iridescent shade, plus eyeliner and mascara to finish it off. Well the clever people at Too Faced cosmetics have come up with everything you need in one handy, and most importantly affordable little palette! The Smoky Eye Make-up Palette costs just £20 and contains bases, a variety of smoky colours, brushes and applicators and a handy guide on how to create a subtle smoky look for the office or all out drama on your eyelids. Get it now from Too Faced counters in department stores nationwide and start practising for Winter!